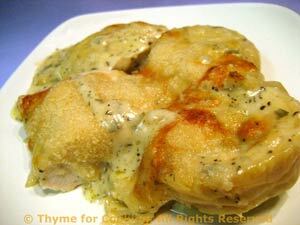 Chicken Savoyard, Thyme for Cooking easy gourmet dinners. This is a variation on the Squash Pastry, trying to keep the flavors but lightening it up a bit. I used the 'neck' end of a butternut squash for these nice circles. (I used half circles in the center). 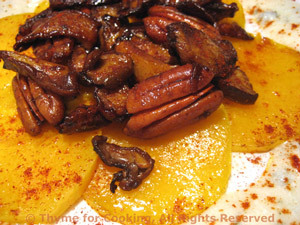 They're topped with sautéed forest mushrooms and pecans and surrounded with Sage Cream. Heat 1 tsp oil and 1 tsp butter in a medium skillet. Add mushrooms and sauté until tender and starting to brown, about 10 minutes. Add pecans, sugar, soy sauce and vinegar. Stir well to combine, then let sauté for 5 minutes longer. Remove from heat and keep warm. Peel squash using vegetable peeler or sharp knife. Cut off the neck end as close to the round end as possible. Cut the round end in half and clean out seeds. Wrap in film and refrigerate. Slice circles off the neck end as thinly as possible. When you can no longer hold it comfortably to slice, cut it in half and slice half circles until you get the amount needed. Heat 1 tsp butter and 1 tsp oil in a medium nonstick skillet over medium-high heat. Add butternut squash slices in a single layer and sauté 3 minutes per side. When done remove from heat. Heat stock, wine and sage to boiling in a small saucepan. 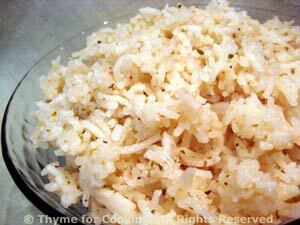 Remove from heat and allow to cool 5 minutes. Divide squash slices and arrange in an overlapping circle on 2 plates. Fill in the center with the half circles. Divide the mushroom / pecan mixture and spoon onto the center. Drizzle the Sage Cream around the edges, sprinkle with paprika and serve.